Celebrity Chef Lindsey Autry creates an easy one dish meal using Dole Garden Soup in Carrot Ginger for a garden fresh flavor. 1. In a small mixing bowl, whisk together the tomato paste, brown sugar, rice vinegar, soy sauce, sesame oil, and olive oil. 2. Slice chicken breast into thin filets, add to the marinade and coat well. Cover with plastic wrap, refrigerate, and allow to marinate overnight. 3. Pre-heat oven to 325F. 4. Place the marinated chicken on a small baking sheet and bake for 20 minutes or until the chicken registers an internal temperature of 165°F. 5. Remove chicken from oven, let cool completely, and slice into thin strips. Set aside. 2. Heat a large sauté pan or wok over medium-high heat for 3 minutes. Add the vegetable oil and sesame oil, and sauté the garlic and ginger for 1 minute. Add the broccoli florets and bell peppers, and continue to stir for 3 minutes. 3. Lower the heat to low and carefully add the Dole Carrot Ginger soup to the pan or wok, and stir in the sugar snap peas. Simmer for 8 minutes or until the vegetables are tender. 4. 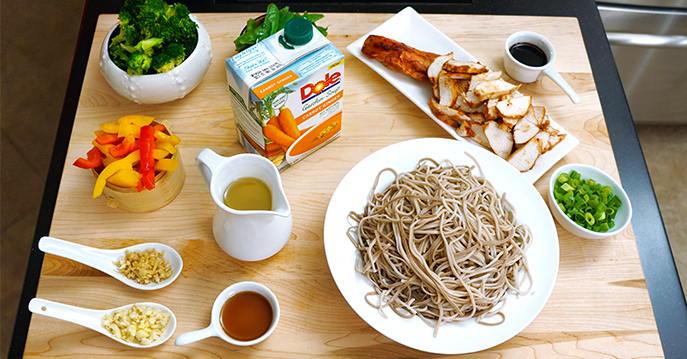 Stir in the soba noodles, sliced chicken breast, and soy sauce. Allow to cook for another 3 minutes to heat through and serve with fresh, sliced scallions.